To become a User Group of the Reserve please email your interest to facilitybookings@fredspassreserve.com Please include all details of your Club, including activities and member numbers and your request will be tabled at the next Board Meeting. What is a User Group? Signs a User Group Licence Agreement that is negotiated by both parties outlining conditions, area of usage and period of usage. Payment of User Groups’ fee, as per the licence agreement and any accounts for electricity. The User Group fee is invoiced by the Board annually. The User Group fee is a contribution to assist towards mowing and watering of the grounds and the general upkeep of the facility. This cost is subsidised by the Board’s operational funding. A User Group calendar is a document provided annually by the User Group to the office, showing their times of use of the facilities at Freds Pass Reserve for the season. This is to ensure there is not a clash of a facility booking. The office will confirm the acceptance of calendar once it has been approved. As the Reserve is a shared facility, User Groups are encouraged to communicate and negotiate facility bookings with each other. Each week the office will e-mail out a copy of the confirmed calendar bookings to all user groups. User Groups who are granted a Licence Agreement to utilise a specified part of the Reserve for an agreed period of time shall have the first right to utilise that area. At times when that User Group is not using their specified area, over which a Licence Agreement is in place the Board may, after consultation with that User Group grant permission to another User Group of use that specified area. The speed limit in and around the Reserve is 20 km/hour. Vehicles can only be parked in designated car parks. Only authorised vehicles can be driven across ovals for parking on an adjacent facility. People who in the opinion of the Board are speeding or driving in an incorrect manner may be banned from the Reserve. Signs are not to be placed on external boundary fence. Signage applications to be approved by the Board prior to the erection of any sign. In areas where joint usage exists, all signs erected of a seasonal nature must be removed at the cessation of their season. A Certificate of Currency is to be provided annually by each User Group. Note: Use of the Reserve will be suspended if the Public Liability Certificate expires and a current one is not provided. The correct documentation in writing with approvals for all liquor licences must be completed and endorsed by the Board prior to submitting to the Liquor Commission. Graffiti will not be tolerated. All graffiti found at the Reserve will be reported to the Northern Territory Police. All vandalism and break-ins must be reported to the Freds Pass Reserve main office immediately. It is also the User Group responsibility to contact the police. The appropriate completed paperwork and a copy of this paper work is to be given to the Freds Pass Reserve main office for record keeping requirements. For day-to-day operations such as facility bookings, maintenance and accounts, User Groups should contact the Freds Pass Reserve main office. For any urgent matters after hours or on weekends, User Groups should contact Caretaker Michael Bates on 0418 432 039 or Grounds Supervisor Maree Davis on 0409 831 522. 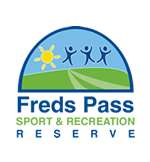 All complaints are to be made to the Operations Manager (operations@fredspassreserve.com.au) in writing and will be forwarded onto the Board as required. Complaints will be addressed in a timely manner. Hand Stand – named after Mr Terry Hand, a Foundation Life Member (deceased). Webber Park – named after Mr Eddie and Mrs Bev Webber in honour of their services to development of rugby league at the Reserve. John Maley Pavilion – named after Mr John Maley, past chairman of Freds Pass Management Board Inc.
Lake View Hall – named after its location overlooking the lake at the Reserve. Sid Lauder Park – named after Rotarian Sid Launder who developed Rotary Park (deceased). Play Group – named after Mrs Heather McBride, an early childhood teacher at Howard Springs Primary School. Names of facilities (ovals, buildings, playing arenas) are not permitted to be changed without prior approval in writing by the Board. Naming Rights – User Groups are not permitted to sell the naming rights of any facility (oval, building, pitches) to any sponsor or sponsors without prior approval in writing from the Board. Tokens are needed to operate the floodlights at the main and indoor arena. The tokens are available through the Freds Pass Reserve main office. Floodlights are charged out at an hourly rate. Horses have no access to the Stuart Highway side of Coulter Way nor on sporting ovals or sporting arenas. Stables are to be cleaned after each use, any broken water pipes or issues with the stables are to be reported to the Freds Pass Reserve main office. Wash Bays are to be cleaned after each use, any broken water pipes or issues with the wash bays are to be reported to the Freds Pass Reserve main office. © Freds Pass Reserve. All Rights Reserved. Made with by jenda27!